Take your car camping, festival weekend, or family “glamping” experience to a whole new level of comfort with this CORE 9 Person Instant Cabin Tent. Designed to be set up in minutes and provide over 100 square feet of living space, it’s a miniature home away from home. The CORE 9 Person Instant Cabin Tent is large space camping at its finest. It’s designed the same as smaller tents; it just has more space. The modern color scheme of lime green, gray, and beige makes it attractive. This is also very portable thanks to its lightweight design. Although the CORE Instant Cabin Tent advertises it sleeps 9 people – and it does – this would be the perfect tent for family camping. A queen-sized mattress, cots for the kids, a playpen for toddlers, and dog crates for the family pet could all fit inside this tent, with room to spare. It’s great for those looking for a tent that provides a more luxurious outdoor experience. While we recommend this cabin tent for larger families and their needs, it wouldn’t be the best for those who are looking for a tent to take hiking. This is better for car camping or extended stays. It’s really too big to be set up for a shorter trip. Also, it’s not made of very durable materials, so don’t expect this to perform well in very cold, windy, or severely rainy conditions, although it has a rainfly. When you first receive your tent, it comes with all the accessories needed to set it up. There are clear instructions, a carrying bag, the actual tent itself, tent stakes, guy lines, and a rainfly. The poles come pre attached, so no need to have those separately. It’s recommended that you seal all the seams before use and that you use a tarp or some type of “floor” with it, but those aren’t included. It’s recommended that you purchase heavier duty stakes than the ones provided, as those can bend easier. The best feature of this 9 person tent? So much space! You get 126 square feet of living space from the 9’ wide by 14’ long living area. It is also 78” high at the tallest point, so there’s enough space for adults who are 6’4” and shorter to comfortably walk around inside. No more bending down to enter the tent. It’s also large enough to sleep nine adults in single sleeping bags or fit two queen sized air mattresses. In total, the weight is 35.1 pounds. There are plenty of windows with zippered mesh openings. 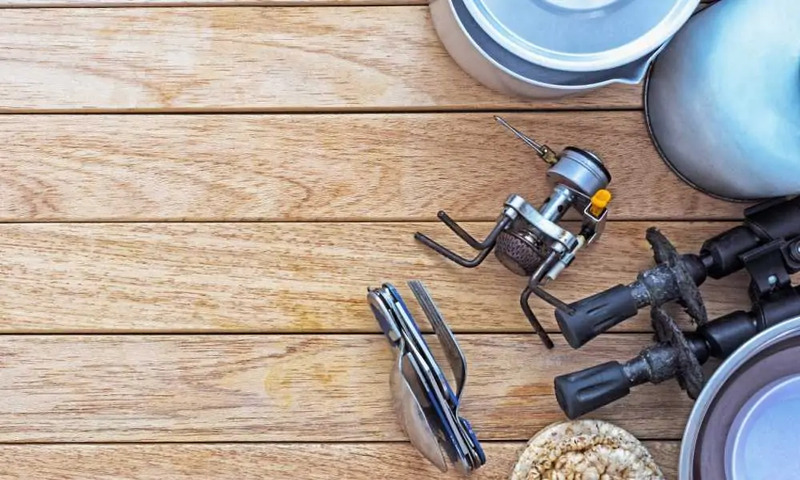 Also, one whole narrow wall can be completely opened and the flaps pushed back to easily accommodate mattresses, folding tables, coolers, backpacks, a portable play pen or dog crate, and plenty of gear. You also get lots of ventilation thanks to the windows, doors, and the adjustable ground vent, too. That makes this tent great for hotter climates. Each of the windows also comes with zippered attached covers to close them. The whole roof features lots of mesh panels so you can sleep under the stars. The tent comes with a privacy room divider that can be zipped in so you can sleep or change clothes in privacy. There are some wall storage pockets to keep items off the floor, and it also has an electrical cord access port you can fully close when you’re not using it. It’s recommended that you have two adults put this together, although one person could do it if they were experienced. Have your tarp set up first on the ground. Then remove the tent from the bag, put it in the middle of the tarp, and unfold each of the lime green corner poles out from the center. Pick up the center poles in the gray sections and raise those vertically until the rest of the tent starts to pop up. Then, go to each corner and lengthen the side poles. Lock the poles in place. You’ll hear a click when they do lock. After that, you can stake down the corners and put the rain fly over the top. Use guy lines for more security to tie it down in windier climates. 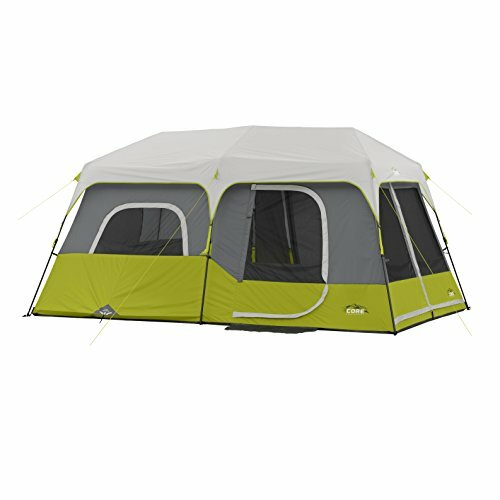 If you’re struggling with leaky tents and want something that has a “bathtub style” floor, then choose this Coleman Montana 8 Person Tent. It has patented WeatherTec corner welds and inverted seams for camping in wetter areas. You still get plenty of room, it sets up easily, and the floor space is 16’ long and 7’ wide. The CORE 9 Person Instant Cabin Tent is truly like taking your own small shelter with you when you go camping. Big enough for a family and comfortable to walk around in, you’ll enjoy its wide open space and design for many years to come. What Do I Need for Camping in a Tent?